Regarded as one of the prettiest bays on the entire West Coast, Monterey Bay is another of California's most beloved locations. 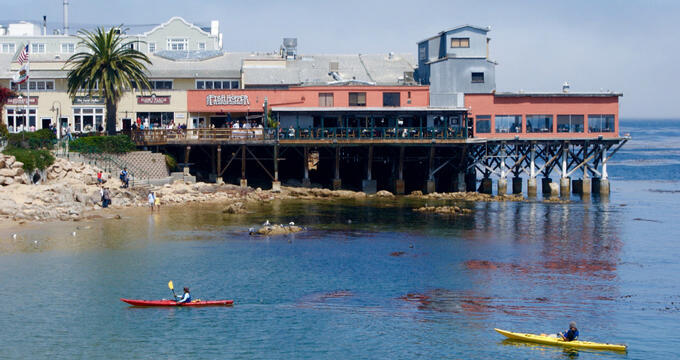 Teeming with wildlife and boasting remarkable views over the Pacific Ocean, Monterey Bay is a highly popular tourist spot, with many visitors eager to get out on the waters and explore the area in a rented kayak or as part of a kayaking tour. As soon as you arrive at Monterey Bay, it’s almost like the ocean is calling to you. Some visitors simply sit on the beaches and admire the views from afar, but there’s no better way to experience Monterey Bay than aboard a kayak, with various companies including Adventures by the Sea and Monterey Bay Kayaks running rentals, tours, and lessons in the area. With various marine protected conservation areas all around Monterey Bay, this area is especially rich in wildlife, offering kayakers some unique opportunities to enjoy close encounters with otters, seals, dolphins, and countless types of fish. Each year, gray and humpback whales also migrate through the area, so whale watching kayaking tours and trips are another incredible activity to enjoy in the Monterey region. Let’s take a look at Monterey kayaking options in closer detail. A whole host of kayaking tours can be experienced and enjoyed all around Monterey. Those looking to get up close and personal with local wildlife on relatively flat and calm waters might be interested in a tour around Elkhorn Slough, for example, while those who want to enjoy the ocean views and paddle along the shoreline could choose a tour of Cannery Row or the Monterey Harbor. There are lots of options available, with each kayaking tour having its own unique aspects and advantages. A particularly important advantage of these tours is that they’re all run by trained, experienced, certified instructors. These guides can teach you the basics of kayaking, as well as offering educational information on local wildlife and geology. They’ll always be happy to answer any questions you might have and provide handy tips to improve your kayaking techniques. One of the most popular kayaking tours in the area is the Sunday Sunrise tour with Monterey Bay Kayaks, which takes in the Monterey Harbor area just as the sun is rising. With the gentle sound of the waves lapping against your kayak and the stunning shades of orange and red filling the sky, it's no wonder this is such a beloved time to kayak around Monterey Bay. Kayak fishing tours around the harbor and trips to Elkhorn Slough are also popular, with several companies offering a myriad of ways for people to paddle the Monterey waters and make memories they’ll never forget. Kayaking is a skill. It needs to be learned and improved over time, and both beginners and experienced kayakers can benefit from lessons. Fortunately, all around the Monterey area, kayaking companies offer a range of lessons, from beginner programs to more advanced or specialized classes. If you’ve not got too much kayaking experience, a good way to start your Monterey kayaking adventure is with a beginner class. These classes go over all the basics of paddling, maneuvering, and controlling your kayak, providing a lot of confidence and helping people learn valuable skills that will serve them well for years to come. Advanced classes can help you learn what to do in case of a capsize and how to handle the choppier waters out in the open ocean. Kayaking tours and lessons can be fun and educational, but many kayakers, both new and experienced, often prefer to simply rent out kayaks and take to the waters to forge their own trails and make their own memories. Again, various kayaking companies around the Monterey area will offer rentals at different rates depending on the length of your rental period and the model of kayak you choose. Renting a kayak can be a great option, allowing individuals, couples, families and groups of friends to enjoy the waters of Monterey at their own pace, taking breaks whenever they like and having the freedom to paddle away in any direction and explore any route they choose. The only disadvantage of renting kayaks in Monterey is that you won’t have the wisdom and knowledge of a guide to lead the way and share information about the area, but this is still a fine option for folks looking to kayak along the waters of Monterey Bay.